Linda McMahon Has Richard Blumenthal In CT Headlock : It's All Politics Republican Linda McMahon remains in a much closer than expected Connecticut race for U.S. Senate, trailing Democrat Richard Blumenthal by just three percentage points in the latest Quinnipiac University poll. Linda McMahon, the Republican U.S. Senate nominee in Connecticut, continues to slap the smiles off a lot of Democrats' faces, metaphorically speaking, of course. The multimillionaire, who made her money as a World Wrestling Entertainment Inc. executive, is still in a very tight race with Democrat Richard Blumenthal, the popular attorney general who was once thought to be a shoo in. A new Quinnipiac University poll finds her only three-percentage points behind Blumenthal, the popular attorney general in what could essentially be a tie, 49-46 among likely voters. A poll from earlier in the month had the race at 51-45, but given the margin of error, the race may or may not have tightened. What's accurate to say is that it's still appears to be very close when talking about the subset of registered voters known as likely voters. McMahon has apparently become a vessel for the anger and desire for change that has gripped the national electorate, Connecticut being no exception. Propelled by Connecticut likely voters who say they are "angry" with government, former wrestling executive Linda McMahon, the Republican U.S. Senate candidate, is closing in on Attorney General Richard Blumenthal, the Democrat, and now trails just 49 - 46 percent, according to a Quinnipiac University poll released today. This compares to a 51 - 45 percent Blumenthal lead in a September 14 likely voter survey by the independent Quinnipiac (KWIN-uh-pe-ack) University poll, conducted by live interviewers. In today's survey, 4 percent are undecided and 9 percent of voters who name a candidate say they could change their mind by Election Day. Blumenthal leads 89 - 9 percent among Democrats. McMahon leads 80 - 16 percent among Republicans. Independent voters shift from 47 - 46 percent for Blumenthal September 14 to 49 - 44 percent for McMahon today. In a gender reversal, women back Blumenthal 56 - 39 percent while men back McMahon 52 - 44 percent. One of the most interesting aspects of the results in Connecticut is a gender split that has been observed in some other states. Men are tilting more towards McMahon while women are more disposed towards Blumenthal. The pollsters also picked up on something else. Blumenthal is wildly popular. He got a whopping 68 percent approval rating and when asked if they had a favorable opinion of him, the yeses outran the nos, 51 percent to 41 percent. By contrast, McMahon's favorable rating was 42 favorable, 43 unfavorable. Given that, how could this race be so close. The answer may lie in that voters appear to be doing the very thing Democrats don't want them to, making the election a referendum on the economy and President Barack Obama. In the survey, Obama had a 45 percent approval rating. It looks like Obama and national Democrats generally could be dragging Blumenthal down. Given this, it will be interesting to see if Obama visits Connecticut again to campaign with Blumenthal as he did recently. "With five weeks to go, the Connecticut Senate race is very close. Attorney General Richard Blumenthal is ahead by only a statistically insignificant 3 points. 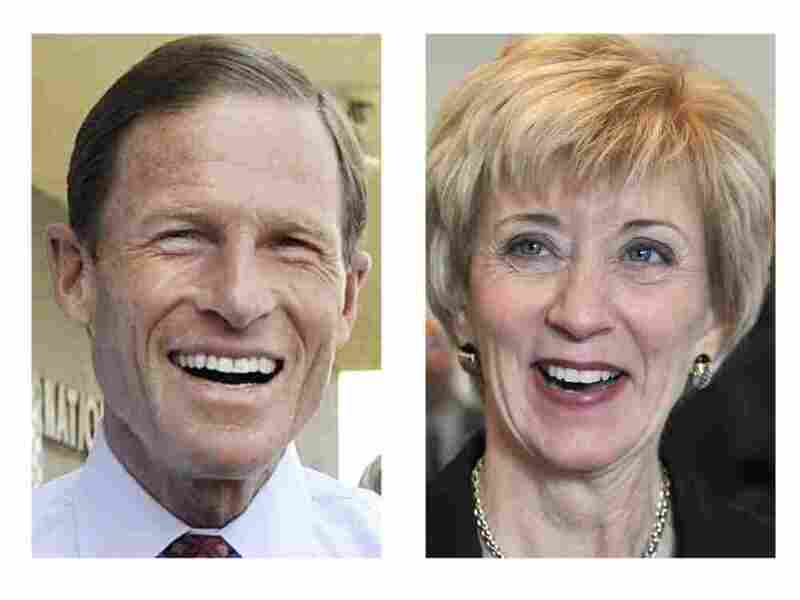 Blumenthal has to be concerned about Linda McMahon's momentum. He can hear her footsteps as she closes in on him," said Quinnipiac University Poll Director Douglas Schwartz, PhD. "But McMahon has to be concerned that voters are still divided on her," Dr. Schwartz added. "There continues to be a big gender gap, as we've seen in other states such a New York and Pennsylvania. Women are going with the Democrat and men are siding with the Republican. "Usually debates don't make much of a difference, but in a race this close next month's debates could be a game changer."